All transactions are safe and secure with a reliable history in online purchasing behind each of our associates. Buy the Johnny Cash Flippin' t-shirt to own Johnny Cash clothing and merchandise. This Johnny Cash shirt is a 100% cotton white adult tee with a sepia tone image on the front from a popular Johnny Cash poster, which shows the musician holding his guitar flippin' the bird. The name "CASH" is printed on the front beneath the image. 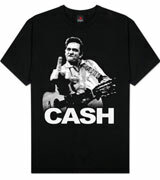 Hauntingly subtle, this Cash t-shirt is a popular choice among fans. In addition to the Johnny Cash Flippin' tee above, browse the Johnny Cash Clothing Gallery for more apparel like men's and women's clothes, kids shirts or hoodies.